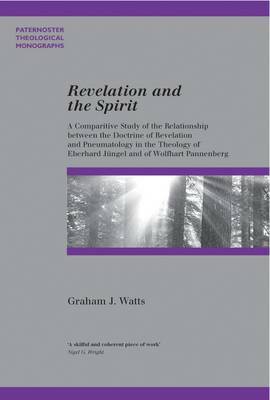 The theme of this study is the relationship between the doctrine of revelation and pneumatology. How can we conceive of the relation between the self-revelation of God and our knowledge of that self-revelation? This is an important question given the postmodern abandonment of any normative understanding of truth and the mushrooming of alternative forms of 'spirituality'. The task of Christian mission in the context of popular pluralism raises the question of the relationship between truth and experience. The focus of the work is a critical comparison between two contemporary Lutheran theologians. Wolfhart Pannenberg and Eberhard Jungel. By contrasting these influential writers, Watts draws clear distinctions between an approach based on metaphor and metaphysics. Both approaches are deemed to be deficient in their construction, and it is argued that some of these problems emerge from a common Lutheran heritage. It is further argued that Trinitarian pneumatology might be better advanced by giving greater weight to the concepts of participation and communion. In doing so, some contribution is made towards long-standing pneumatological questions, including the personhood of the Holy Spirit and the distinction between God as Spirit and the Holy Spirit.